This is the perfect place not only for the Usedom Music Festival, but also for the Varietè at the sea, the OZ-ball, theatre plays or big conferences such as the stomatologists’ congress. The Kaiserbädersaal in Heringsdorf’s heart is the perfect place for very different events up to 600 people. Concerts and entertainment are in here since the begin of the summer hurly-burly. That’s why a chic Strandcasino stood already 1898 at the today’s building place. And already at that time it had got a big hall with a stage, reading rooms and an access to a restaurant. The building has completely burned down after World War II, and instead of it the Russians built a new one – the House of Culture, also known as Kulti. 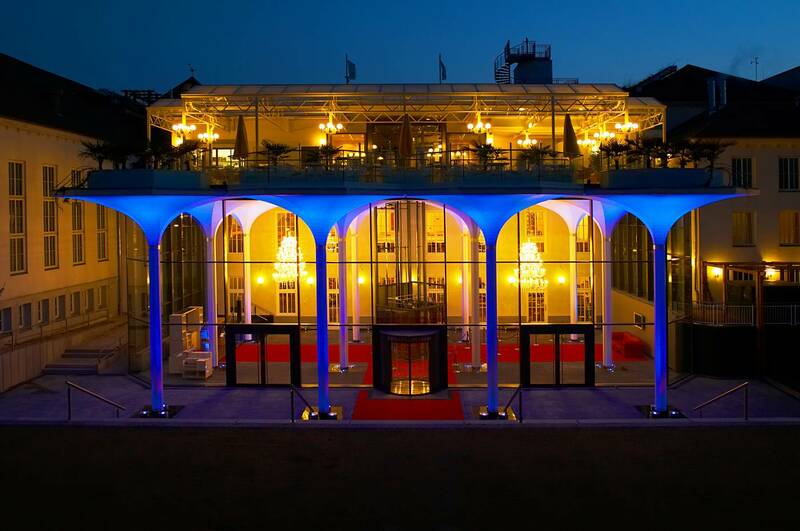 It has been completely renovated after the fall of the GDR and it shines now at the Heringsdorf promenade, in a game of lights, with 10-meters-high towers on its sides, and it is the access to the today’s Kaiserbädersaal. It doesn’t matter if on stage or in one of the loggias – in this hall you can still feel the great past times. The stage, 11×12 meters, is height-adjustable and it has got a lowerable orchestra pit. Width: 11,5m. Depth 11,2m. Stage height: 12,2m. Stage extendable in the front (by the dimensions of the orchestra pit) – hydraulic lifting platform. Stage opening 8,5m, stage overview 6,3m. near field (4x Meyer Sound MM4-XP) Delay (4x d & b E3) add. From May till October there is something more than just the swoosh of the sea in the air of the “3 Seaside Resorts”. In the three concert shells in Ahlbeck, Heringsdorf and Bansin the Baltic-Sea-air is fulfilled nearly everyday with music. It doesn’t matter if concerts, rock concerts, huge classical performances, Variete theatre or open-air-theatre for children – the three concert places directly at the promenade are full of life in the summer’s afternoons and also in the evenings, if the night is warm. The benches invite you to sit down and listen to the music. There is a fresh wind around your nose. The atmosphere amid flowers is relaxing. The oldest of the still preserved of the three concert shells is the one in Ahlbeck. It was built by the Actien-Gesellschaft für Holzbearbeitung (company for wood processing) in Wolgast in 1914 and it replaced an old concert shell which already stood there. It is impressive due to its unique style, and it is decorated with ornaments typical to the Seaside Resort Architecture. In 1929 also Heringsdorf received a concert place with a music pavilion and a fountain. Up to this moment people could listen to musical performances only in a small concert hall in the former Strand-Casino, from now on it was also possible during open-air-concerts. The today’s modern construction, made out of steel and wood, has been built in 1995. This pavilion, similar to an open shell, has got the perfect acoustics for small and for big concerts. On evenings it is illuminated with glorious colours, and during the day the windows of the semicircular concert shell in Bansin offer a spectacular view over the Baltic Sea. The place near the scene has been inaugurated at Whitsun 1932. On its left and right side there are the historic bathing machines. All three of them are a place where many feasts and events take place and their programmes are since a long time fixed parts of the summer concerts in the “3 Seaside Resorts”. Surrounded by a dunes’ landscape, directly at the promenade and the pier in Bansin, the Tourist’s House (Haus des Gastes) in Bansin receives the tourists of the smallest of the “3 Seaside Resorts”. If you would like to know what is going on in Bansin and also in the other two resorts, which events take place here or what things are worthy to see, this is the right place. That’s because it is the seat of the tourist information office. But the building, built 1998 by the architect and painter Gabriela Beck-Schäfer, it’s quite more than just a place where you can get some information. On the first floor there is a small gallery, which hosts various exhibitions. If you are looking for a hot-spot, you may use the one from the Tourist’s House for free. The building also has got a hall for events with up to 80 seating places. Readings, lectures, cabaret, concerts, meetings – the stage hosts many different events and might be rented. The room can be darkened, it’s got a big screen and a lightning system, which can be used in very different ways.